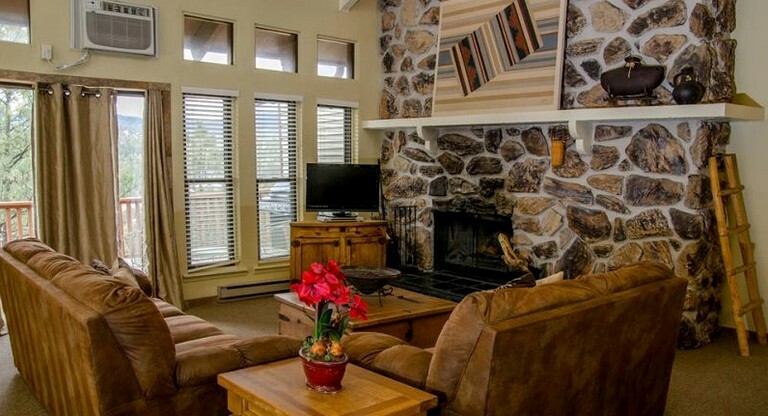 This luxury lodging is located in Ruidoso, New Mexico, and can accommodate eight guests. It has three bedrooms and two and a half bathrooms. 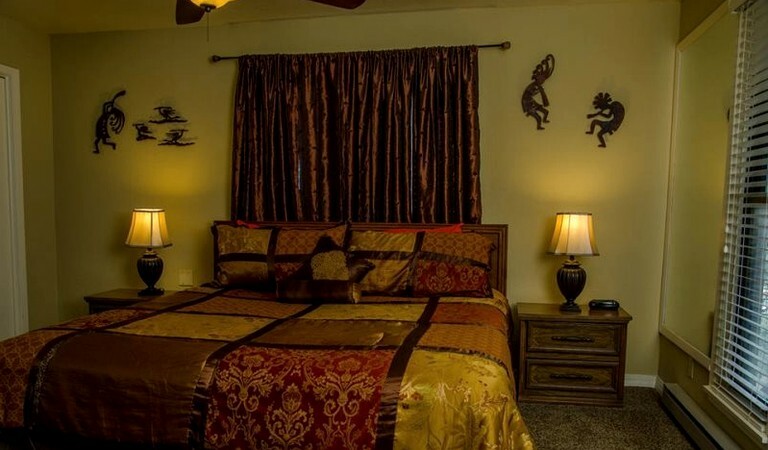 The first bedroom features a king-size bed, nightstands with lamps, a ceiling fan, and carpeted flooring. 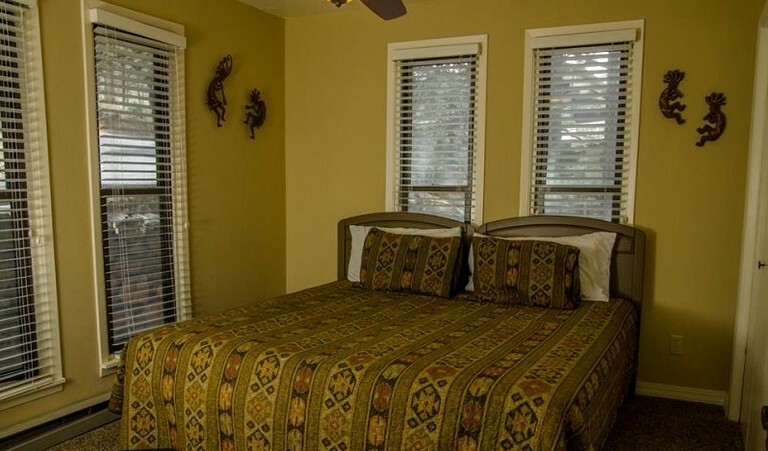 The second bedroom also features a king-size bed, a ceiling lamp, and carpeted flooring. The third bedroom contains two queen-size beds. Linens and towels are provided. 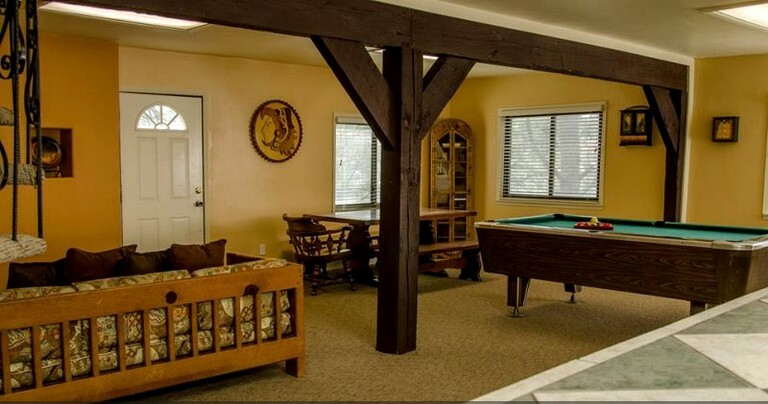 Indoors, guests will enjoy a fully equipped kitchen, a wood-burning fireplace, a pool table, a television, and a wet bar. Outdoors, they will enjoy a deck with seating and a barbecue grill. 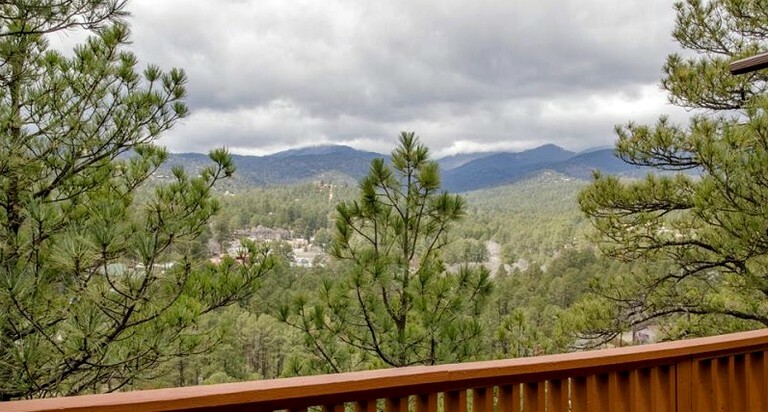 Nestled among pine trees and perched atop a hill with sweeping views of nearby mountains, hills, and valleys blanketed in verdant forest, this luxury lodging is located in Ruidoso, New Mexico. 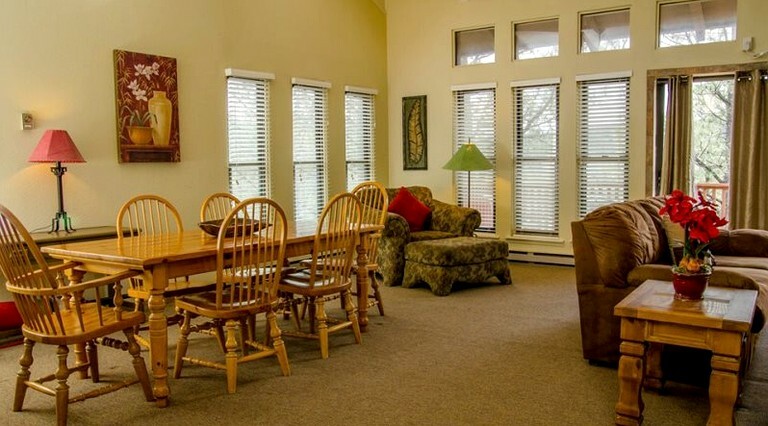 It feels secluded, yet it is just a few minutes from downtown Ruidoso and less than 20 minutes from a casino, a ski resort, a golf course, and a putt-putt golfing and go-karting center. Set in the Sierra Blanca mountain range, which blends into the Sacramento Mountains to the south, the resort town of Ruidoso and its surrounding area present guests with an alpine paradise, overbrimming with natural beauty and outdoor recreational opportunities. The landscape is simply majestic, with tree-covered hills and mountains stretching in all directions, and guests can explore and enjoy it in a variety of ways, whether by hiking, biking, horseback riding, picnicking, fishing, skiing, tubing, golfing, or zip-lining. About 11 miles to the northeast of the town, guests will find the 25,080-acre Fort Stanton-Snowy River Cave National Conservation Area, which is filled with multi-use trails for guests to explore by foot, bike, or horseback. About 18 miles to the northwest, they will find the nearly 50,000-acre White Mountains Wilderness Area of Lincoln National Forest, which encompasses over one million acres, and is filled forests, canyons, streams, and even more multi-use trails. About an hour and 20 minutes to the southwest, guests will find the perfect day trip opportunity: White Sands National Monument, with dunes so white they look like they are made of snow. 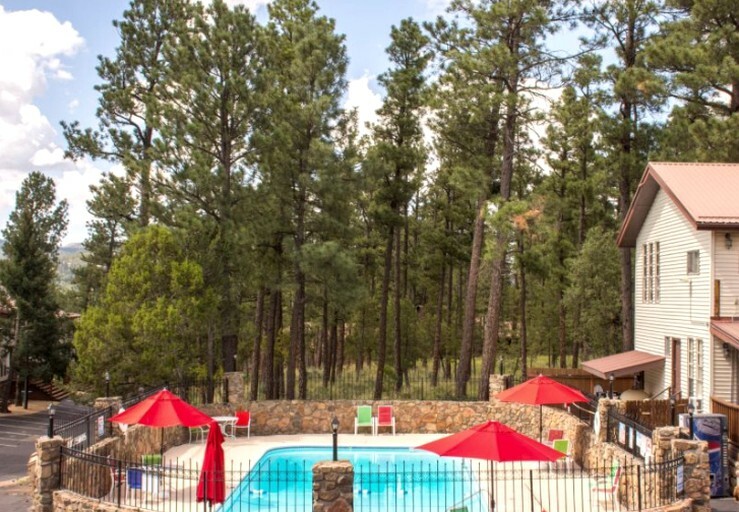 However, guests do not need to leave Ruidoso to enjoy the outdoors; the town's parks and recreation department maintains a system of parks, with a swimming pool, a dog park, walking trails, tennis courts, and fishing lakes and rivers. Other attractions in the area include Grindstone Stables, The Links at Sierra Blanca, Ski Apache resort, Ruidoso Winter Park, the Spencer Theater for the Performing Arts, the Mountain Gods Resort and Casino, Noisy Water Winery, and the Hubbard Museum of the American West, more information on which can be found in the Activities section of this page. In the White Mountain Wilderness Area of Lincoln National Forest, guests can explore nearly 50,000 acres of forests, canyons, and streams by trekking through a variety of hiking and walking trails, which provide a wide range of difficulty levels. Lincoln National Forest as a whole covers over one million acres, and guests will find over 200 miles of trails in its Smokey Bear Ranger District. Guests can also go hiking, biking, horseback riding and picnicking at both the nearby Fort Stanton-Snowy River Cave National Conservation Area and White Sands National Monument, with even more bike trails to be found at Cedar Creek. The Ruidoso Parks and Recreation Department also maintains a number of parks with many recreational facilities, including a swimming pool, a dog park, walking trails, tennis courts, and fishing lakes and rivers. Guests can also explore their natural surroundings by horse, with guided trail rides, sleigh rides, and carriage rides available through Grindstone Stables. At The Links at Sierra Blanca, guests will find a Scottish-style golf course and a driving range, with lessons available. In the winter, they can go skiing at the Ski Apache resort or tubing at Ruidoso Winter Park, and they will find a variety of ski shops in the area. However, there does not need to be snow for guests to experience downhill adventures; they can also go mountain biking and zip-lining at Ski Apache, and they can go sand sledding down the dunes at White Sands National Monument! For group and family fun, guests can go putt-putt golfing and go-karting at Pillow's Funtrackers. 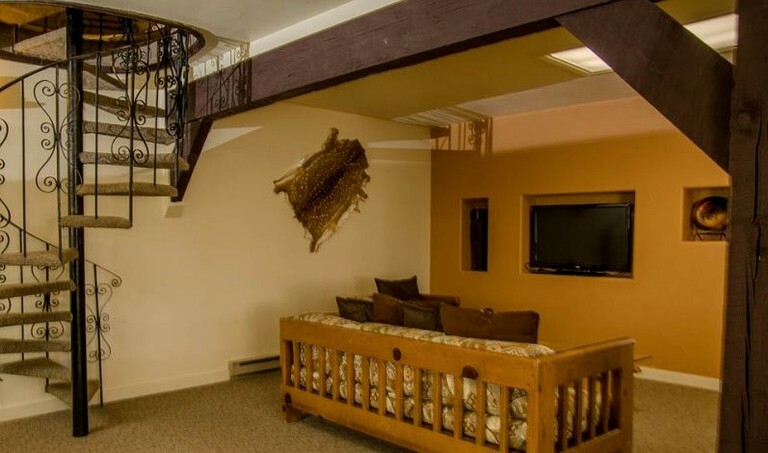 For indoor entertainment, they can attend theatrical shows and musical performances at the Spencer Theater for the Performing Arts, or try their luck at the Inn of the Mountain Gods Resort and Casino. They can also learn about the history of the West at the Hubbard Museum of the American West. Guests can explore a variety of fine wines and gourmet cheese, olive oil, and other foods at Noisy Water Winery. For dining, they can visit a variety of restaurants, including Cafe Rio Pizza and El Camino Nuevo Mexican Food. Downtown Ruidoso offers a range of shopping opportunities as well. Last but certainly not least, for self-care and relaxation, guests can treat themselves to a variety of spa and massage services at Blue Lotus Healing Arts Center, Spa Botanica, Fusion Medical Spa, and Presence Massage, among other service providers.